Over here, a huge stack of exams, sitting ungraded since… no, I can't say, it's too embarrassing. There, a grant proposal that extensive experimentation has shown will not, in fact, write itself. And I still owe a response to all the responses and criticism to my Disgorge the Cash paper for Roosevelt. So naturally, I thought this morning would be a good time to sit down and ask what we can learn from comparing the path of labor costs in the Employment Cost Index compared with the ECEC. The Employment Cost Index, or ECI, measures changes in employers’ cost of compensating workers, controlling for changes in the industrial-occupational composition of jobs. … The ECI is intended to indicate how the average compensation paid by employers would have changed over time if the industrial-occupational composition of employment had not changed… [It] controls for employment shifts across 2-digit industries and major occupations. The Employer Costs for Employee Compensation, or ECEC… is designed to measure the average cost of employee compensation. Accordingly, the ECEC is calculated by multiplying each job quote by its sample weight. In other words, the ECI measures the change in average hourly compensation, controlling for shifts in the mix of industries and occupations. The ECEC simply measures the overall change in hourly compensation, including the effects of both changes in compensation for particular jobs, and changes in the mix of jobs. Here are the two series for the full period both are available (1987-2014), both raw and adjusted for inflation ("real"). First, the two series are closely correlated. This tells us that most of the variation in compensation is driven by changes within occupations and sectors, not by shifts in employment between occupations and sectors. This is clearly true at annual frequencies but it seems to be true over longer periods as well. 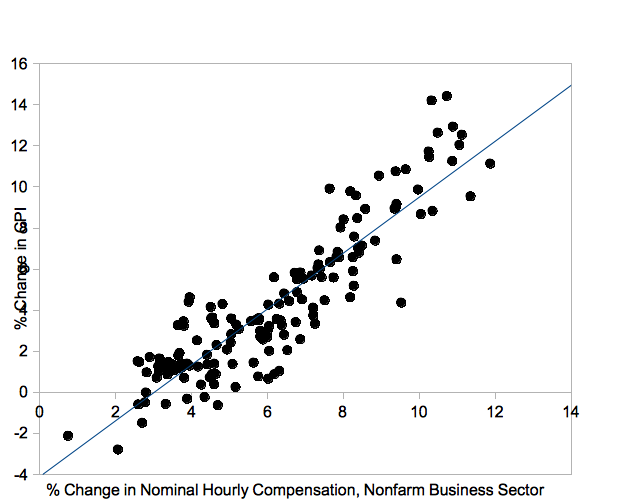 For instance, let's compare the behavior of compensation in the five years since the end of the recession to the last period of strong wage growth, 1997-2004. The difference between the two periods in the average annual increase in nominal wages is almost exactly the same according to the two indexes — 2.7 points by the ECI, 2.6 points by the ECEC. In other words, slower wage growth in the recent period is entirely due to slower wages growth within particular kinds of jobs. Shifts in the composition of jobs have played no role at all. What's going on in the most recent year? Evidently, there has been no acceleration of wage growth for a given job, but the mix of jobs created has shifted toward higher-wage categories. This suggests that to the extent wages are rising faster, it's not a sign of labor-market pressures. (Some guy from Deutsche Bank interprets the same divergence as support for raising rates, which it's hard not to feel is deliberately dishonest.) As for which particular higher-wage job categories are growing more rapidly -- I don't know. And, what's going on in 1995? That year has by far the biggest divergence between the two series. It could well be an artifact of some kind, but if not, seems important. 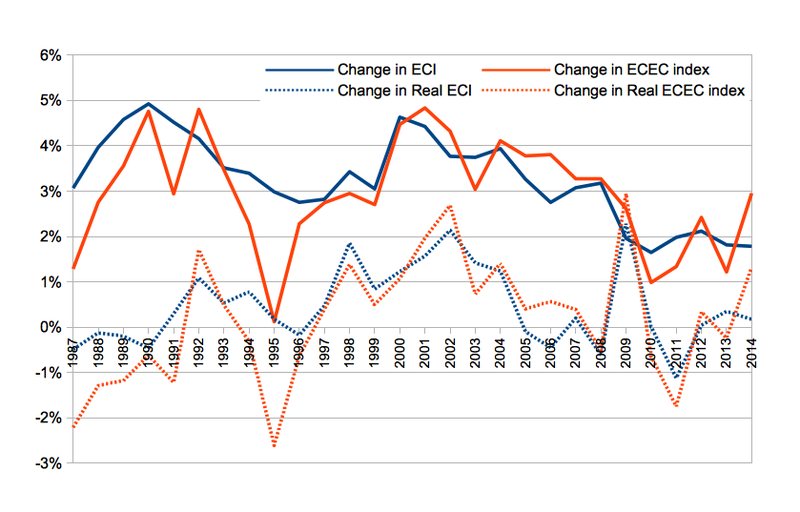 A large fall in the ECEC relative to the ECI could be a signature of deindustrialization. I'm not exploring the question further now (those exams…) but it would be interesting to ask analogous question with some series that extends earlier. It's likely that if we were looking at the 1970s-1980s, we would find a much larger share of variation in wage growth explained by compositional shifts. Should we adjust for inflation? I give the "real" series here, but I am in general skeptical that there is any sense in which an ex post adjustment of money flows for inflation is more real than, say, The Real World on MTV. I am even more doubtful than usual in this case, because we are normally told to think that changes in nominal wages are the main determinant of inflation. Obviously in that case we have to think of the underlying labor-market process as determining a change in nominal wage. Still, if we do compute a "real" index, things look a little different. Real ECI rises 14 percent over the full 1987-2014 period, while real ECEC rises only 5 percent. So now we can say that about two-thirds of the increase in real wages within particular job categories over the past three decades, was offset by a shift in the composition of employment toward lower-paid job categories. (This is all in the first decade, 1987-1996, however.) This way of looking at things makes sense if we think the underlying wage-setting process, whatever it is, operates in terms of a basket of consumption goods. 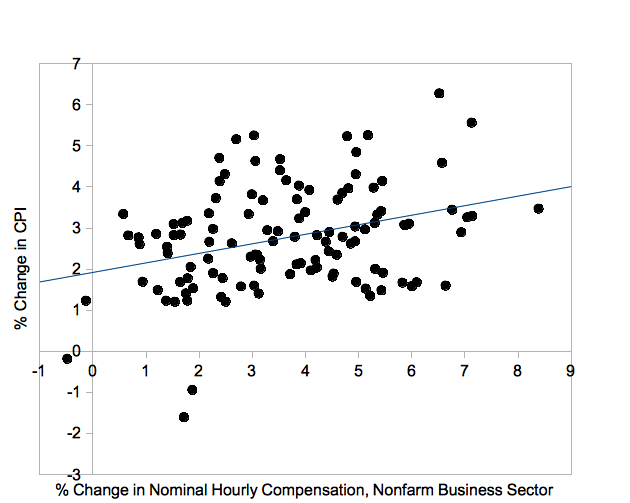 This invites another question: How true is it that nominal wages move with inflation? Conventional economics wisdom suggests we can separate wages into nominal and "real" components. This is on two not quite consistent grounds. First, we might suppose that workers and employers are implicitly negotiating contracts in terms of a fixe quantity of labor time for, on the one hand, a basket of wage goods, and on the other, a basket of produced goods (which will be traded for consumption good for the employer). This contract only incidentally happens to be stated in terms of money. The ultimate terms on which consumption goods for the workers exchange with consumption goods for the employer should not be affected by the units the trade happens to be denominated in. (In this respect the labor contract is just like any other contract.) This is the idea behind Milton Friedman's "natural rate of unemployment" hypothesis. In Friedman's story, causality runs strictly from inflation to unemployment. High inflation is not immediately recognized by workers, leading them to overestimate the basket of goods their wages will buy. So they work more hours than they would have chosen if they had correctly understood the situation. From this point of view, there's no cost to low unemployment in itself; the problem is just that unemployment will only be low if high inflation has tricked workers into supply too much labor. Needless to say, this is not the way anyone in the policy world thinks about the inflation-unemployment nexus today, even if they continue to use Friedman's natural rate language. The alternative view is that workers and employers negotiate a money-wage, and then output prices are set as a markup over that wage. In this story, causality runs from unemployment to inflation. While Friedman thought an appropriate money-supply growth rate was the necessary and sufficient condition for stable prices, with any affect on unemployment just collateral damage from changes in inflation, in this story keeping unemployment at an appropriate level is a requirement for stabilizing prices. This is the policy orthodoxy today. (So while people often say that NAIRU is just another name for the natural rate of unemployment, in fact they are different concepts.) I think there are serious conceptual difficulties with the orthodox view, but we'll save those for another time. Suffice it to say that causality is supposed to run from low unemployment, to faster nominal wage growth, to higher inflation. So the question is: Is it really the case that faster nominal wage growth is associated with higher inflation? Since 1985, though, the relationship is much looser, with an R-squared of 0.12. And even is that driven almost entirely by period of falling wages and prices in 2009; remove that and the correlation is essentially zero. So while it was formerly true that changes in inflation were passed one for one into changes in nominal wages, and/or changes in nominal wage growth led to similar changes in inflation, neither of those things has been true for quite a while now. 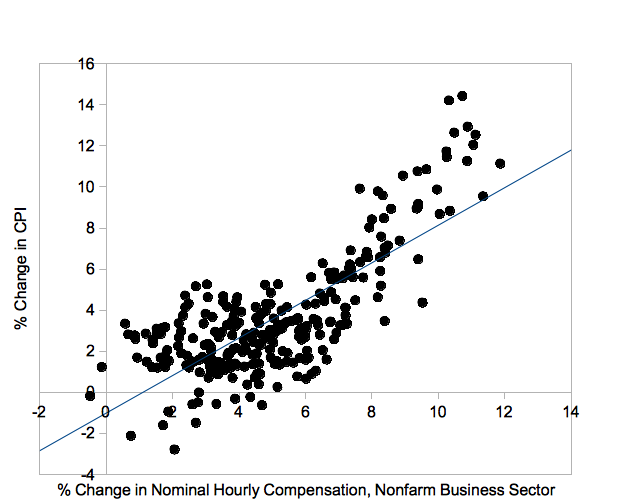 In recent decades, faster nominal wage growth does not translate into higher inflation. Obviously, a few scatterplots aren't dispositive, but they are suggestive. So supposing that there has been a delinking of wage growth and inflation, what conclusions might we draw? I can think of a couple. On the one hand, maybe we shouldn't be so dismissive of the naive view that inflation reduces the standard of living directly, by raising the costs of consumption goods while incomes are unchanged. There seems to be an emerging conventional wisdom in this vicinity. Here for instance is Gillian Tett in the FT, endorsing the BIS view that there's nothing wrong with falling prices as long as asset prices stay high. (Priorities.) In the view of both Keynes (in the GT; he modified it later) and Schumpeter, inflation was associated with higher nominal but lower real wages, deflation with lower nominal but higher real wages. I think this may have been true in the 19th century. It's not impossible it could be true in the future. On the other hand. If the mission of central banks is price stability, and if there is no reliable association between changes in wage growth and changes in inflation, then it is hard to see the argument for tightening in response to falling unemployment. You really should wait for direct evidence of rising inflation. Yet central banks are as focused on unemployment as ever. It's perhaps significant in this regard that the authorities in Europe are shifting away from the NAIRU (Non-Accelerating Inflation Rate of Unemployment) and increasingly talking about the NAWRU (Non-Accelerating Wage Rate of Unemployment). If the goal all along has been lower wage growth, then this is what you should expect: When the link between wages and inflation weakens, the response is not to find other tools for controlling inflation, but other arguments for controlling wages. This may be the real content of the "competitiveness" discourse. Elevating competitiveness over price stability as overarching goal of policy lets you keep pushing down wages even when inflation is already low. Worth noting here: While the ECB's "surrender Dorothy" letter to the Spanish government ordered them to get rid of price indexing, their justification was not, as you might expect, that indexation contributes to inflationary spirals. Rather it was that it is "a structural obstacle to the adjustment of labour costs" and "contribute to hampering competitiveness." This is interesting. In the old days we would have said, wage indexing is bad because it won't affect real wages, it just leads to higher inflation. But apparently in the new dispensation, we say that wage indexing is bad precisely because it does affect real wages. This might seem to contradict the previous point but it doesn't, it's just that the post-2009 recovery period includes both a negative composition shift in 2008-2009, when unemployment was high, and a positive compositional shift in 2014, which cancel each other out. From A Theory of Employment: "Except under peculiar conditions, a decline in effective demand which reduces the amount of employment offered in the general run of industries will not lead to 'unemployment' in the sense of complete idleness, but will rather drive workers into a number of occupations [such as] selling match-boxes in the Strand, cutting brushwood in the jungles, digging potatoes on allotments which are still open to them. A decline in one sort of employment leads to an increase in another sort, and at first sight it may appear that, in such a case, a decline in effective demand does not cause unemployment at all. But the matter must be more closely examined. In all those occupations which the dismissed workers take up, their productivity is less than in the occupations that they have left." The only piece I know of that makes the connection between demand and productivity variation across sectors is this excellent article by John Eatwell (which unfortunately doesn't seem to be available online), but it is focused on long run variation, not cyclical. The ECB's English is not the most felicitous, is it? The Spanish version is "contribuyen a dificultar la competitividad y el crecimiento," which also doesn't strike me as a phrase that a native speaker would write. Maybe it sounds better in the original German. The fact that inflation didn't spike hard upwards in the 3-4% unemployment of the late 1990s should have been a big warning that we are in a different era than the prior one. I wonder why 1985 was the transition point? Can't remember any particular policy or financial changes from then. Well, there are two distinct steps here. First is the link between unemployment and wages, and second is the link between wages and inflation. A failure of inflation to accelerate when unemployment falls tells us that one of those links is broken, but not which one. "Can't remember any particular policy or financial changes from then." 1995 is just after NAFTA came into effect, no? It is pretty clear that your post lacks an underlying coherent theory. Looking at data without a well-defined theoretical perspective is not different from reading tea leaves or from freely associating about an ink-blot. Accordingly, the argument consists of a parade of various popular stories (here five in total, i.e. labor/political, China/robot, Friedman, markup, NAIRU). under the condition of product market clearing if price P and productivity R in the consumption and investment good industry as well as distributed profit Yd remain unaltered in the period under consideration. A falling average wage rate for the business sector as a whole increases unemployment. The testable structural employment equation is general; it includes the working of the wage-price mechanism and contains Keynes's argument as a special case. Finally, it holds under inflationary and deflationary conditions. The testable structural employment equation terminates inconclusive wish-wash and unambiguously determines the relationship of wage rate, price, productivity, aggregate demand, the income distribution, and employment. It seems to me that "angels on a pin" is the opposite of "inkblot storytelling." One describes excessive formalization, the other insufficient formalization. We'd like to find a path between the two extremes -- to move from the concrete to abstract, and then back to the concrete. IMHO, the relevant point here is not real wages, but the wage share. Real wages are equal to productivity X wage share. But "productivity" depends on a lot of stuff that doesn't have a direct correlation with economic policies, for example if a lot of oil wells close in Saudi Arabia arguably productivity in the USA will fall, even if this has nothing to do with workers negotiating their wages in nominal terms or high unemployment keeping wages low. Thus the relevant correlation would be between the wage share, unemployment, and inflation; in this story unemployment should lead to a lower wage share. We could say that a big reserve army of labour is needed to keep the wage share low. PS: Friedman idea that workers negotiate wages in real terms is crazy because, if this was true, real wages would never rise and would be stuck at some fixed level (admittedly this in part happened in the USA but I think that it is a weird situation). What happened in 1985? I'm currently reading Varoufakis's Global Minotaur, and it seems that in the late 70's, early 80's the USA shifted from being basically an exporter nation to being basically an importer nation, sustained from the fact that other nations badly want to be net exporters. The change in 1985 could be the effect of the regime change of what V. calls the "Global Plan" regime to the "Global Minotaur" regime. In this hipothesis, up to the early 80s wages made the larger part of USA effective demand, later USA demand became more capital driven. This change is what you point out in your "Disgorge the cash" paper. Thus in the first period growth in nominal wages constrained growth in nominal prices, while in the second period the disgorged cash adds to aggregate demand, and the price level decouples from the wage level, causing a fall in the wage share. "This change is what you point out in your "Disgorge the cash" paper." Meaning that in your paper you point out a change in the relationship between management and shareholders in corporations, but this happens more or less at the same point in time that Varoufakis says there is the change between "Global Plan" and "Global Minotaur". "[Fiscal Consolidation] is a prerequisite for maintaining confidence in the credibility of governments’ fiscal targets. Positive effects on confidence can compensate for the reduction in demand stemming from fiscal consolidation, when fiscal adjustment strategies are perceived as credible, ambitious and focused on the expenditure side. The conditions for such positive effects are particularly favourable in the current environment of macroeconomic uncertainty." "We explore how fiscal consolidations affect private sector confidence, a possible channel for the fiscal transmission that has received particular attention recently as a result of governments embarking on austerity trajectories in the aftermath of the crisis. Panel regressions based on the action-based datasets of De Vries et al. (2011) and Alesina et al. (2014) show that consolidations, and in particular their unanticipated components affect confidence negatively. The effects are stronger for revenue-based measures and when institutional arrangements, such as fiscal rules, are weak. To obtain a more accurate picture of how consolidations affect confidence, we co nstruct a monthly dataset of consolidation announcements based on the aforementioned datasets, so that we can study the confidence effects in real time using an event study. Consumer confidence falls around announcements of consolidation measures, an effect driven by revenue-based measures. Moreover, the effects are most relevant for European countries with weak institutional arrangements, as measured by the tightness of fiscal rules or budgetary transparency. The effects on producer confidence are generally similar, but weaker than for consumer confidence. Granted its' the ECB's research arm, but still. They seem to be saying austerity doesn't "work" via the confidence fairy. It makes things worse. Wasn't the confidence fairy supposed to compensate for or mitigate the pain of making the export sector more competitive? Or it would help boost growth along with exports? But it hasn't worked in Greece, Spain, etc. I'm reading that Europe is actually easing up on the fiscal austerity and so it will make it appear as if QE and the painful work of gaining competitiveness have worked more than they have with a possible recovery in Europe. "But the outlook for wages is highly uncertain even if price inflation does move back to 2 percent and labor market conditions continue to improve as projected. For example, we cannot be sure about the future pace of productivity growth; nor can we be sure about other factors, such as global competition, the nature of technological change, and trends in unionization, that may also influence the pace of real wage growth over time. These factors, which are outside of the Federal Reserve's control, likely explain why real wages have failed to keep pace with productivity growth for at least the past 15 years. For such reasons, we can never be sure what growth rate of nominal wages is consistent with stable consumer price inflation, and this uncertainty limits the usefulness of wage trends as an indicator of the Fed's progress in achieving its inflation objective." One could read this in either direction. We could get excessive(?) wage growth without the commensurate pick up in inflation. Or they could raise rates as inflation picks up with out wage growth. I see it as more likely that wage growth picks up first as we've seen below-target inflation for many years and haven't seen accelerating inflation since the 1970s when unions were powerful enough to negotiate price hikes into future contracts (Most Violent Years!) That's no longer the case. "A tight labor market may also work to reverse some of the adverse supply-side developments resulting from the financial crisis. The deep recession and slow recovery likely have held back investment in physical and human capital, restrained the rate of new business formation, prompted discouraged workers to leave the labor force, and eroded the skills of the long-term unemployed.15 Some of these effects might be reversed in a tight labor market, yielding long-term benefits associated with a more productive economy. That said, the quantitative importance of these supply-side mechanisms are difficult to establish, and the relevant research on this point is quite limited." "There are valuable human activities which require the motive of money-making and the environment of private wealth-ownership for their full fruition. Moreover, dangerous human proclivities can be canalised into comparatively harmless channels by the existence of opportunities for money-making and private wealth, which, if they cannot be satisfied in this way, may find their outlet in cruelty, the reckless pursuit of personal power and authority, and other forms of self-aggrandisement. It is better that a man should tyrannise over his bank balance than over his fellow-citizens; and whilst the former is sometimes denounced as being but a means to the latter, sometimes at least it is an alternative. But it is not necessary for the stimulation of these activities and the satisfaction of these proclivities that the game should be played for such high stakes as at present. Much lower stakes will serve the purpose equally well, as soon as the players are accustomed to them...."
We have the same idea about the big picture of procyclical shifts in labor productivity as workers switch between firms and industries. I might frame it a bit differently than you do, though. I'm more inclined to see the problem in terms of coordination broadly, rather than matching, so I'm doubtful that an optimal career path is a useful benchmark. It seems to me that even when an economy is at "full employment," there is a very large fraction of the workforce that could be doing something more productive if demand were greater -- and (and this is important) if the coordination problems involved in shifting people to new jobs could be overcome. I don't think the reason mature capitalist economies grow no faster than 2-3% a year is that this is the limit to potential output in any physical sense, but because the pace of reallocation of labor and other resources if growth were faster would require more active planning by the state (or by a centralized financial system.) Along with this, while I agree that the lower productivity growth we see in periods of slack demand probably reflects in some part poor matches between workers and employers, and also the erosion of "human capital" associated with unemployment, I think it also, and probably more importantly, reflects the fact that at any given moment the economy includes a mix of more and less productive enterprises, and labor moves to the former from the latter more rapidly when demand is strong. Anyway, it's an area I'd like to think about more. If you get any interesting responses to your post, do let me know. What's the short identifier for the ECEC data series? I can't find it in FRED? There are three distinct series that you will need to splice together. ECI is more strongly correlated with the output gap than ECEC, not less. It all depends what period you look at. The Great Recession is unusual in that wages deccelerated across the board, which is not typical of previous downturns. If you try 1986-2008, you'll find a stronger correlation with ECEC and the output gap, and no correlation between ECI and the output gap at all. This is also consistent with the idea (from Leijonhufvud among others) that wage flexibility trends to amplify rather than dampen employment fluctuations, because in the short run there is very little substitution between labor and other factors, while income effects are strong. There is (at least) one component of labor compensation that IS a basket of consumption goods rather than a nominal wage: employer-sponsored health insurance. I've thought a bit about what could be learned from exploiting the fact that compensation has a real (in kind) component and a nominal (wage) component, but I've never been able to pin it down exactly. Great post, but you have to stick to this rather than those tests... I'm disappointed that no one figured out what the blip was in 1994/5 -- this is the EITC reform under Clinton that dramatically expanded the subsidy for low wage workers. This of course spiked supply and effective pay while lowering costs for employers.